Gabriel is tall at 6"5'. He has a scar across his left eye, complimenting nicely with his red pupils. He has white hair and beard, with his hair being tied into a pony tail. He wears lighter armor that don't protect much, but allow him to be more mobile. He has a skull mask, which is actually a hard white rock. He has an old great sword that he is able to use with one hand. He has no other items, other then traveling equipment. Because of this, Gabriel's left arm is covered in a steel gauntlet and sleeve for a better defense. Personality: When out of battle, Gabriel is actually a bit of a passive person. He never initiates fights, and is a chivalrous man. He doesn't protect people unless he knows them, but that he won't attack innocents. He will usually try not to fight to the death, as he sees every battle as a chance to grow stronger. If needed, he will kill, nor will he hesitate. He is a man of honor, and will admit defeat when he knows he is going to lose. He is not book smart at all, though is a pretty wise man, in his own opinion. 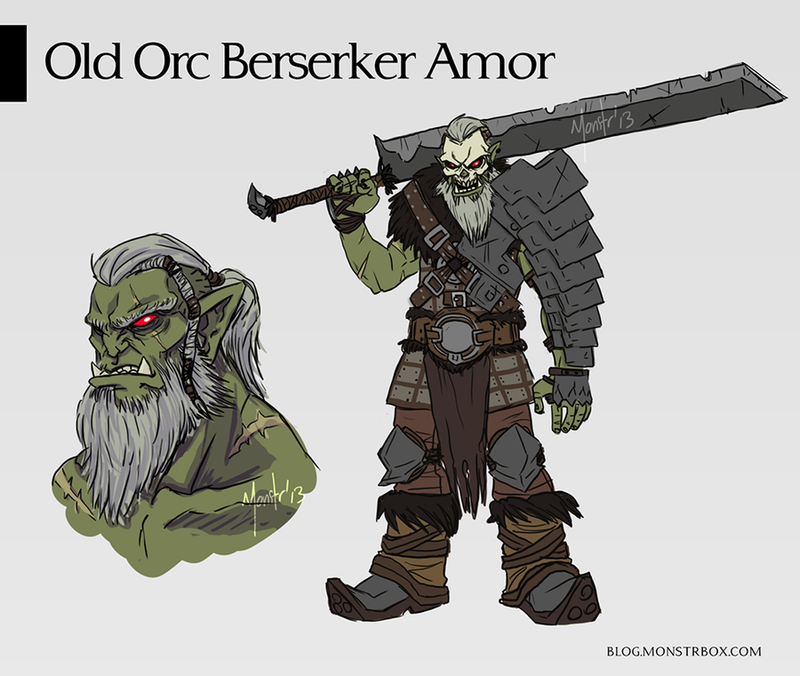 He's not sure if he really is, but compared to other orcs, he is. History: Not much to say here really. Gabriel was born into an average orc family and was trained to use a great sword. He was trained at a young age and was trained for most of his life. When he was 14, he left home to travel, and spent that time fighting and training. He will usually go anywhere and leave almost immediately before the locals can try to kill him. Because of this, he mainly lives off the roads and in his tent, always traveling. Battling skills: In Battle, Gabriel excels in getting up close and personal. He will use the armor on his left arm to block attacks and then swing with his weapon. Not much else to say here, really. I know your not done Jt but just saying, the orcs havent reformed their empire yet. They are currently in warring clans.